A new research center combining the tools of chemistry and astronomy will use the unique laboratory of interstellar space to free the study of basic chemistry from the restrictive bonds of Earth. The Center for Chemistry of the Universe will allow scientists to explore new types of chemical reactions that occur under the extreme conditions of space. The center will combine laboratory experiments, theoretical studies, and radio-telescope observations to dramatically expand our understanding of the processes that build molecules that may "seed" young planets with the building blocks of life. The Center forges a unique research collaboration among leading scientists in the field of astrochemistry from the University of Arizona, The Ohio State University, the Harvard-Smithsonian Center for Astrophysics, the National Institute of Standards and Technology, the National Radio Astronomy Observatory, and a group of chemists and physicists at the University of Virginia engaged in research to understand the fundamentals of chemical reactions. "We hope to answer some very basic questions, such as just how did the molecules that ultimately became us get their start?" said Brooks Pate, Professor of Chemistry at the University of Virginia (UVa) and leader of the team that will form the new center. The team received an initial grant of $1.5 million from the National Science Foundation (NSF) to form the center during the next two years. If the NSF then fully approves the initiative, the foundation will provide funding of $4 million per year for up to ten years. The new center will bring together laboratory researchers, theoreticians, and observers using radio telescopes of the National Radio Astronomy Observatory (NRAO) and the Arizona Radio Observatory (ARO). The group of chemists participating in the center have discovered more than half of the new interstellar molecules identified worldwide in the past 18 months. The NRAO operates the giant Robert C. Byrd Green Bank Telescope in West Virginia, which has been used to discover ten new interstellar molecules in the past three years, a record unmatched by any other telescope. The NRAO also is the North American partner in the international Atacama Large Millimeter/submillimeter Array (ALMA) project. 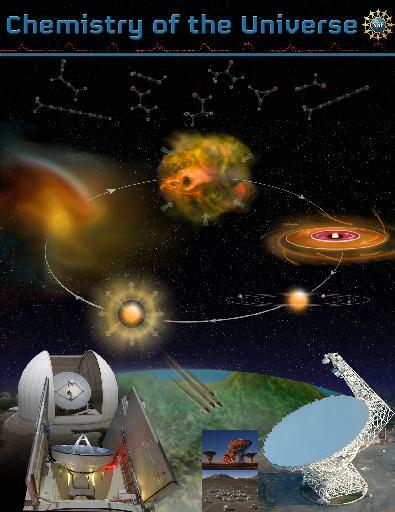 ALMA is expected to provide an unprecedented ability to study interstellar chemistry when it goes online in 2012. "A central theme of chemistry is to understand how chemical reactions work. Most of our current knowledge of how molecules are formed came from laboratory experiments with solutions. However, in interstellar space, reactions occur in gases and on surfaces, such as on tiny cosmic dust grains. We're going to focus on studying these poorly-understood processes, and thus break chemistry out of our Earth-bound constraints," said Philip Jewell, Deputy Director of the NRAO, and one of the team members. "The combination of experimentalists, theoreticians and radio-telescope observers will allow quick feedback and testing of new ideas and better understanding of what we see in our own and other galaxies," said Anthony Remijan of the NRAO. The new center also will pursue an extensive educational effort, including student programs, new courses at UVa, and displays and outreach activities at the NRAO's Green Bank Science Center and other museums. The University of Virginia is a leading public research university with funding from the National Science Foundation and several other public and private funding organizations. The National Radio Astronomy Observatory is a facility of the National Science Foundation, operated under cooperative agreement by Associated Universities, Inc.